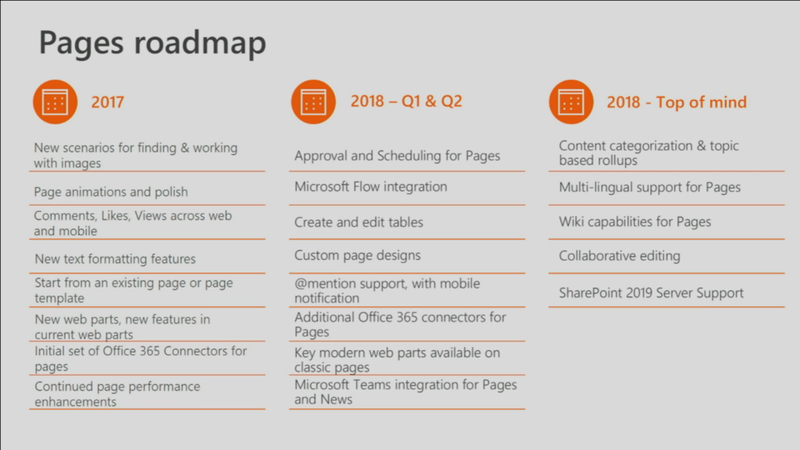 Learn how Modern Pages are reinventing what you can do with SharePoint. Pages in SharePoint have long been a powerful and essential tool for businesses, but now we’ve added an exceptional level of usability, simplicity, and speed to that experience. See the new Pages technology in action as we show you how it powers experiences across your enterprise in Modern Team Sites and Communication Sites. We will address a broad spectrum of scenarios and dive deep into improvements we have made to the Modern Page authoring and consumption experiences. We’ll also walk through a demo of Modern Pages authoring to show you how easy it is to create beautiful, interactive, fast, and responsive pages in SharePoint. This was a rather extensive demo of building a modern UI collaboration site and a modern UI communications site. It was cool to see, but pointless to explain.